Forty-eight Dallas Census tracts are considered high-blight; 184 moderate-blight neighborhoods; and 118 low-blight areas. A new study by the University of North Texas shows more than half of the 350 Census tracts in Dallas are moderate or high-blight areas. Those are neighborhoods with neglected, rundown or abandoned buildings. Sixteen percent of the city is in the high-blight category, according to the study commissioned by Habitat for Humanity. 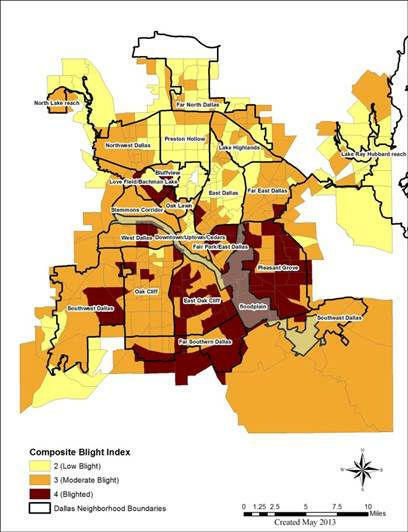 A map shows the largest high blight areas in Pleasant Grove, East Oak Cliff and South Dallas. The median property value in the high blight neighborhoods is $79,000 compared to $236,000 for low-blight areas. Researchers created a composite blight index by melding socioeconomic and blighted property data available from the Census, Dallas County Appraisal district, City Hall and other agencies. Of the 350 Dallas Census tracts, 118 are low-blight areas;184 moderate-blight; 48 high-blight. Habitat for Humanity CEO Bill Hall says the study shows there are some neighborhoods in Dallas that just cannot improve until run-down, burned out buildings are removed. Over four years, Dallas demolished nearly 1,600 residential and commercial properties. And it’s expensive. A recent tear-down of 400 houses cost the city $1.6 million. Over the past two years, Dallas filed $10 million in liens against properties for city mowing and cleaning, boarding-up abandoned property, and demolition. But the city’s only collected about $1.5 million of that total. Dallas city leaders announced on Tuesday a new partnership aimed at improving blighted and crime-ridden neighborhoods. Economic Partners Investing in Communities, or EPIC, includes the Dallas Police Department, GrowSouth, Safer Dallas Better Dallas, Communities Foundation of Texas and Dallas Area Habitat for Humanity.